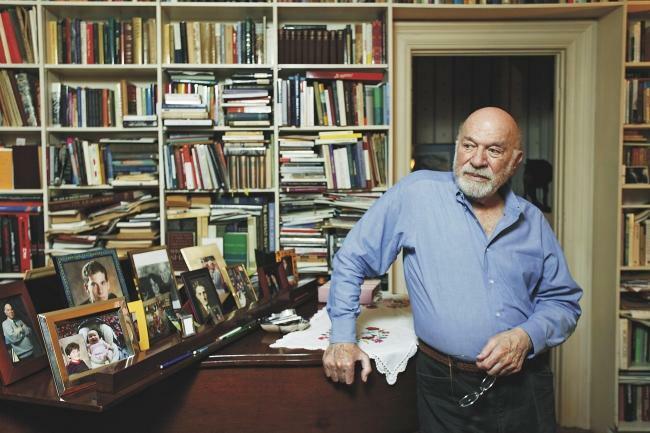 Following Stanley Cavell’s death last month at the age of 91, we invited some of his students, friends, and admirers to write about his life and work. We were particularly interested in soliciting personal essays that acknowledged how Cavell’s thinking or character as a scholar and teacher had influenced the contributor’s own thinking or teaching, or helped to point them in new directions in their work. We ultimately received eight such pieces, with essays by Charles Bernstein, R.M. Berry, Beci Carver, J.D. Connor, Andrew Epstein, Walt Hunter, Imani Perry, and Johanna Winant. You can find all the essays gathered here. My own contribution, “The Philosopher as the Hobo of Thought,” discusses Cavell’s profound influence on my own writing. I initially encountered this remarkable hobo of thought in graduate school, nearly twenty-five years ago, when I was first blown away by the strangeness and beauty of his writing. What other philosopher or theorist is so eloquent, so moving, so curiously human when discussing the problems of philosophy and literature and film? Like many others, I’ve always been drawn to Cavell in part for his genius as a writer, a stylist, a creator of striking, distinctive, indelible sentences. Certain phrases and passages, including some I’ve quoted above, have simply become totemic for me, recurring at odd moments and never far from my thoughts. They seemed to speak to something deep-seated in me that I hadn’t quite articulated or fully understood. His writing also seemed to have a weird knack for providing powerful language, images, and metaphors for concepts and ideas that happened to be at the center of my own work. Looking back, I can now see Cavell became something of a guiding spirit hovering over both of my books, echoing and deepening their themes. My review of Flarf: An Anthology of Flarf recently appeared in the Los Angeles Review of Books. Faced with the daily calamity of the Bush years, Flarf testified that verbal play, and the creative détournement of our culture’s own language, could be a liberating act of resistance. Its antics were a valuable method of pushing back against what Wallace Stevens called, in another dark time, the almost unbearable “pressure of reality.” Perhaps right now we desperately need art forms that can seize on the language of our time, expose its absurdity, its deceit, and its sinister designs on us, and repurpose it for different ends. But in 2018, the online culture of misogyny, racism, stupidity, and hatred that Flarf exposed doesn’t need much further unearthing: it seems to be everywhere. As we gasp for air and sanity in the depths of Trumpworld, Flarf seems prescient but also somewhat redundant. To paraphrase Man Ray’s famous remark about why Dada could not survive in New York: Flarf cannot live in America. All America is Flarf, and will not tolerate a rival. “Attention Equals Life”: Now Out in Paperback! For anyone who has been dying to get my recent book but couldn’t stomach the cost, good news! It’s just been published in paperback by Oxford University Press, now at a more affordable price — plus it’s got some new blurbs/review excerpts on the back. “A book of enormous breadth and ambition, Attention Equals Life is at once astonishing and reaffirming, challenging and clarifying. It engages more broadly than its scholarly focus would suggest. Epstein (Florida State Univ.) 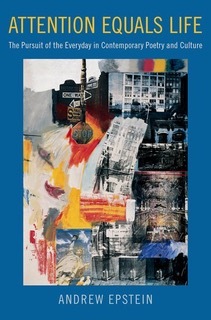 explores contemporary poetry’s obsession with the quotidian, setting that obsession in literary context (both historical and current) and identifying it as contemporaneous with cultural interest in the ordinary, the commonplace, the “real.” His argument is persuasive, the information is abundant and compelling, the endnotes and bibliography are extensive if not exhaustive, and the style is accessible. This book has something for everyone-poets, critics, teachers of literature and contemporary culture, fans of contemporary poetry, and even those who think that no poetry of value has emerged in the US since Robert Frost…Summing Up: Essential.” –J. A. Zoller, Choice. I was very excited to learn that my book, Attention Equals Life: The Pursuit of the Everyday in Contemporary Poetry and Culture, has been named an “Outstanding Academic Title for 2017” by Choice, the magazine of the Association of College & Research Libraries. A Florida State University professor’s book on the rise of “experimental realism” in modern poetry is making waves in the academic world. Andrew Epstein, a professor in FSU’s Department of English and associate chair of the department’s graduate English program, is the author of Attention Equals Life: The Pursuit of the Everyday in Contemporary Poetry and Culture. The book, published by Oxford University Press, was recently named one of the “Outstanding Academic Titles for 2017” by Choice, a magazine of the Association of College & Research Libraries (ACRL). Being named to this list is a prestigious accomplishment, as it is often influential in determining which books libraries will purchase. Epstein’s book has also made the shortlist for another top award in his field: the Modernist Studies Association Book Prize. Attention Equals Life examines why modern poetry and other art forms have become so preoccupied with representing the ordinary and humble experience of daily life. Gary Taylor, chair of the Department of English, praised Epstein, saying his book “really does make the ordinary extraordinary. Writing in Choice, reviewer J.A. Zoller stated, “A book of enormous breadth and ambition, Attention Equals Life is at once astonishing and reaffirming, challenging and clarifying. It engages more broadly than its scholarly focus would suggest. “. . . This book has something for everyone — poets, critics, teachers of literature and contemporary culture, fans of contemporary poetry, and even those who think that no poetry of value has emerged in the U.S. since Robert Frost,” Zoller added. Taylor described Epstein as a tremendous resource for the English department, as “he is exceptionally valuable in linking the Graduate Program in Literature, Media and Culture to the Graduate Program in Creative Writing.” In addition, he credited Epstein with being instrumental in bringing the nationally acclaimed poet and critic Stephanie Burt to the university, where she gave both a poetry reading and a critical lecture on the relationship between poetry and song. Attention Equals Life is the culmination of work from the past several years on modernism and the everyday, particularly American poetry moving toward the mid-century. The book is extremely readable for broad audiences and makes a compelling extension of discussions of the everyday, both from an American standpoint and with a focus on mid-century literary production. The nuanced attention to poetic language is convincing and the theoretical and philosophical argumentation is bested only by detailed analyses of poems, which are frequent and efficient. Close attention to the text itself is always diligently related to the American philosophical tradition so that textual analyses do not operate as mere illustrations but signal a new step in scholarship. This study challenges our perception of poetry as a genre and as a form – it raises new questions in terms of poetics, aesthetics, and ethics, and particularly how poetry works as a form of cultural and political action. Attention Equals Life is a completely convincing work. For more about the prize, see here. I was recently interviewed by the scholar, poet, and interviewer-extraordinaire Andy Fitch for the Los Angeles Review of Books, for a new series of interviews Fitch is doing with authors of recent scholarly books. I had the opportunity to talk at length about my new book, Attention Equals Life: The Pursuit of the Everyday in Contemporary Poetry and Culture. Fitch and I discuss the central concerns of my book and how I came to write it, including theories and poetics of the everyday, French New Wave film, secular vs. spiritual approaches to dailiness, politics, an app that lets you take one second of video per day, and many other things. You can find the interview — “So Insistently Focused on the Daily: Talking to Andrew Epstein” — here. 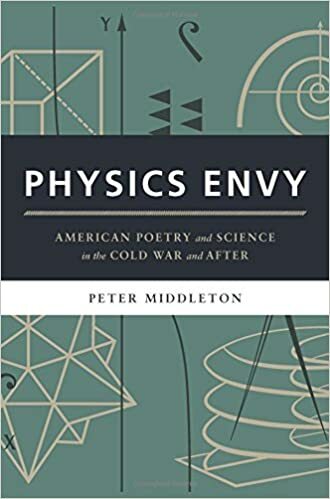 My review of Peter Middleton’s new book, Physics Envy: American Poetry and Science in the Cold War and After (University of Chicago Press, 2015) has just been published by American Literary History, as part of the journal’s new ALH Online Review.